When it comes to marine toilets, ?K? and ?O? are letters that boaters will embrace. In this case, K.O. represents ?Kills Odors? and is the name of a great cleaning product from Raritan Engineering that is available now at Boatersland. K.O. ? part number RAR1PKO22 ? is a safe, non-chemical, non-polluting product that keeps boats odor free between pumpouts. Boaters only need to use about 4 oz. of K.O. 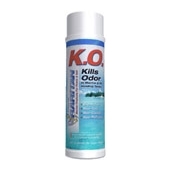 per 25 gallons of holding tank capacity as part of an effective odor killing schedule. K.O. is another product available at Boatersland that proves our commitment to being the number one Raritan repair parts site.